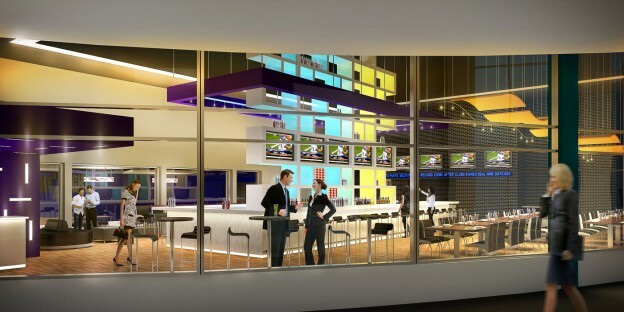 Interior space planning of a 50,000 square foot entertainment venue encompassing multiple restaurants, bowling alley, lounge and arcade. Unique interior finish and furniture specifications for each zone are all connected through a network of common gathering areas. Common gathering areas include a contemporary mix of metro-inspired neutrals with a concrete floor and colorful wall accent materials. Exposed high ceilings are combined with unexpected ceiling elements to present a unique sense of scale. The Mexican Cantina restaurant includes a contrasting black and white palette with pops of hot pink and lime green. Custom patterned resin panels are backlit to create a curved wall feature. A grand wrap-around bar is the central feature of the Sports Bar with custom millwork highlighting an extensive multi-media showcase. The second level Lounge plays with light and color to create a unique nighttime experience. This entry was posted in Interior Design, Structural Engineering on September 5, 2012 by swolock.